Not just for formal events, black tie is becoming evermore popular at weddings. Don’t know your cummerbunds from your dress stripes? We’ve put together this simple guide to help you navigate this sharpest of all the suiting looks. Black wool is the standard when it comes to dinner jackets, but midnight blue offers a compelling alternative and contemporary addition to modern black tie dressing. The midnight blue produces less of a sheen than black when under artificial light, so is said to look “blacker than black”. Sometimes a wool (lamb) and mohair (goat) blend will be used to make a lighter, more breathable cloth with a crisp texture. A jacket with silk facings, usually grosgrain (ribbed) or satin, on a shawl collar, peaked lapel or notched lapel. 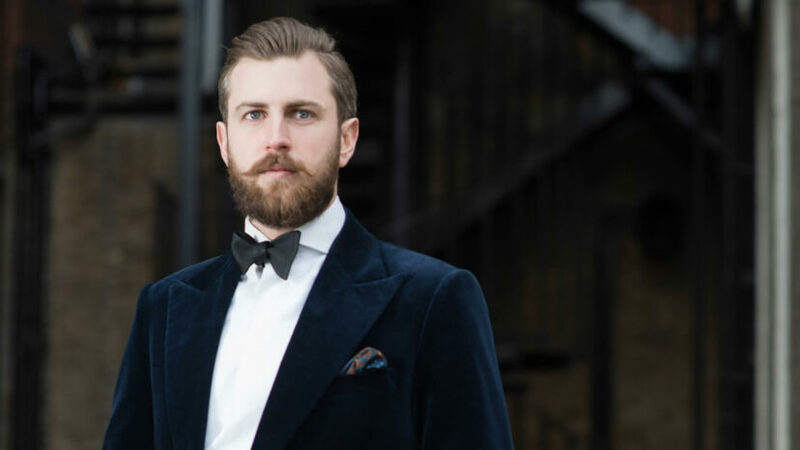 Many current fashion stylists and writers see notched lapels as less formal although they (like peaked and shawl) have been used since the first evolution of the garment. Trousers in a cloth to match the jacket, with a single silk or satin braid covering the outer seams. This is a broad waist sash, usually pleated. Dating back to colonial India, it can be worn instead of a low-cut waistcoat. A white dress shirt (a marcella or pleated front is traditional) with double cuffs, cufflinks, and a cutaway or winged standing collar. Currently, the more popular option is the cut away collar. A black silk bow tie matching the silk lapel facings. Shirt studs are often dispensed with today, but can add to a more traditional look. Black shoes—traditionally patent leather court shoes; now often highly polished or patent leather Oxfords instead.